Public Transit not only provides basic mobility for many in our community, it is also essential urban infrastructure – just like roads, bridges, tunnels and utilities – that is crucial to the economic, social and environmental wellbeing of our region. Safe, reliable, environmentally-sustainable and affordable transit that is accessible to all. Join PPT in affirming the Transit Bill of Rights by signing on HERE – the list of supporters who have signed is already more than 5,000 community members strong! Founded in 2010, we have raised consciousness about the importance and value of public mass transit. We’ve provided education about the nature of the funding crisis, organized rallies and demonstrations, and mobilized thousands of people across Pennsylvania to exert the pressure required to pass the state transportation bill, Act 89, which finally removed the threat of more draconian cuts to public transit and further damage to our region. Since May 2014, PPT has mobilized eight community-led campaigns to advocate for service in transit deserts–engaging over 4,000 residents to take action. Five of these campaigns were successful, and much needed bus service has been restored in Garfield, Penn Hills, Groveton, Mifflin Estates and Baldwin. These campaigns have changed the conversation about transit needs in our county and led to the adoption of Port Authority’s service guidelines, which provide a more transparent and inclusive process for decision-making and include equity as an equal factor along with efficiency and effectiveness. The campaigns we’ve supported have not only given residents access to jobs and opportunities, along with more independence, they also demonstrate the power of community-led collective action. There are a variety of organizations working on improving transit, but we are the only group which engages directly with transit riders and workers—serving as a model for groups across the country. Bus operators, in particular, have been instrumental in our community campaigns. PPT helps residents understand their rights to access public transit and to develop and share their voices on what our transit system should look like. Public transit is OUR transit, and the people who operate, maintain, and use the system everyday should have a primary seat at the table. PPT is focused on promoting civic engagement and democracy, and we aim to connect the struggles for a strong public transit system to other struggles in our communities, including fair housing, clean air and water, workers’ and riders’ rights, racial justice, economic justice, and environmental justice. Pittsburghers for Public Transit is a project of the Thomas Merton Center. We’ve received support from many local foundations including the Heinz Endowments, the Hillman Foundation, the Opportunity Fund, the Three Rivers Community Foundation, and the Pittsburgh Foundation. We’ve also received donations from ATU Local 85, the Mon Valley Unemployed Committee, and hundreds of individual donors. 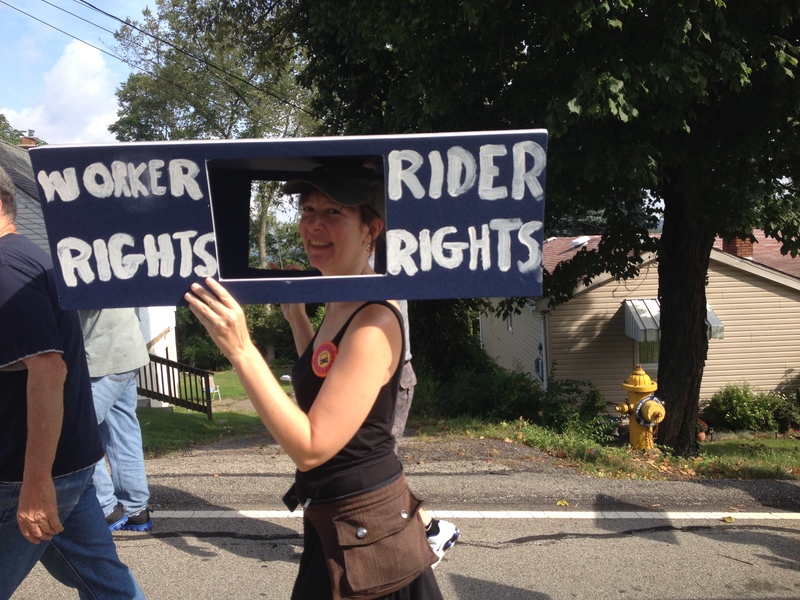 Worker rights AND rider rights – we roll together!